However, it will only take another spike in oil prices or a rate war to push even profitable carriers back into the red this year. And much greater damage would be inflicted on last year’s unprofitable carriers, such as HMM ($720m in the red) and Yang Ming ($219m). Moreover, the upcoming IMO low-sulphur regulations, which could see fuel prices jump 50%, will put more pressure on what Drewry describes as “financially vulnerable carriers”. Indeed, at an expected premium of $200 per ton on compliant fuel, it has been estimated that this could add some $2.5m of cost to an average Asia-North Europe roundtrip, plunging a profitable loop into the red, unless the carriers receive adequate compensation from their customers. The consultant speculated on the possibility of weaker carriers being “pushed into M&A by the extra costs associated with the new low-sulphur law”. Drewry said that, “without wanting to be too alarmist”, the fallout from IMO 2020 “could inspire another major carrier bankruptcy”, while another potential route for the industry would be to “trigger more defensive M&A” activity among the carriers. 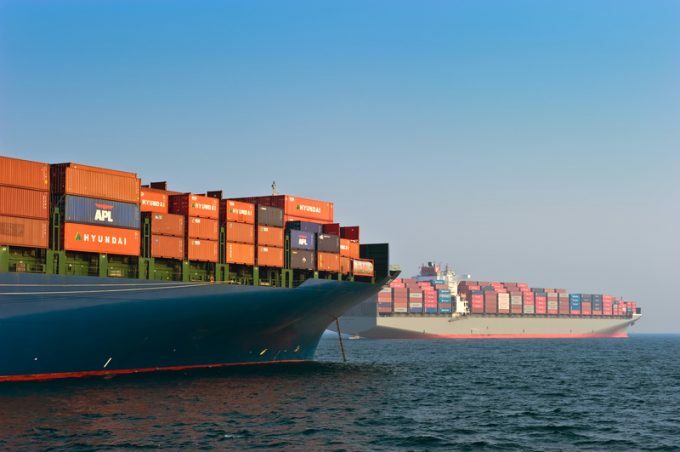 The last round of M&A in the liner industry started with the merger of COSCO and CSCL in 2016, the year that saw the demise of Hanjin Shipping, and finished with the merger of Japanese carriers K Line, MOL and NYK into the Ocean Network Express (ONE), 12 months ago. Seven lines now control some 75% of the world’s deepsea containership fleet, noted Drewry. With the end of the world predicted by some financial pundits in 2019 and 2020, there is no guarantee of rising volumes, especially in the light of increased protectionism, as practiced by Mr Trump, coupled with a slowing China. (Note blanked FE-Eur sailings recently). There is no reason why IMO2020 should push fuel prices to double if the refiner producers get their act together and produce more LSFO, with a possibility that HSFO could become the endangered species because less operators will be buying this. Indeed, with oil price spikes caused by unrest in Venezuela, Libya and the Iran embargo, the world geopolitics is likely to have more influence on bunker pricing than production of a new fuel type. The big question for those rushing to fit scrubbers is whether the price differential really will be $ 200 or maybe closer to $ 50 ……and even the other way around by the end of 2020. The article did not mention the local (?) effects Brexit will have to disrupt traffic patterns – although Drewry seem to think that container availability will not be an obstacle, notwithstanding that 45′ PWHCs will be the box of choice, which are not exactly growing on trees. The IMO will not push anyone into consolidation that would not be at that point anyway (and, as P&O and Nedlloyd showed, two weak lines merging does not add up to one stronger line) – the mergers that could happen will be because the operators/ shareholders have lost the appetite to fight a losing battle. If there is an effect on operators it will be on those carriers who are still operating obsolete tonnage – such as conventional reefer companies who could not justify the reinvestment, technology and know-how required to tool up to fully containerised services. The last round of consolidation between COSCO and CSCL…..was OOCL too small to be worth mentioning? Why would RHJ say that consolidation has reached its limit? Surely the industry still has plenty of victims to be merged and taken over – surely consolidation is only limited by the imagination of its leaders and financiers? It is always possible that CMA-CGM could take Evergreen or any one of the Top 10 could merge with another Top 10 operator.